This Inklingo PDF has diamonds with 1 inch sides and half and quarter diamonds (triangles). Several other sizes are available. These shapes are used with the new Flower Power Add-On shape collection for Willyne Hammerstein's design. Use scissors or cut several layers at a time with a rotary cutter—and have stitching lines on every piece! 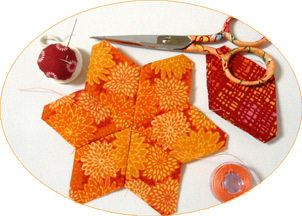 Use a running stitch instead of English Paper Piecing (EPP). It's more portable, more fun, more precise, and faster!